HockeyPucks hiking and highpointing: Whiteface (Belknap) - 1664 Ft / Durrell Mtn. - 1650 Ft.
Whiteface (Belknap) - 1664 Ft / Durrell Mtn. - 1650 Ft.
DESTINATION: Mt. Whiteface (Belknap) / Durrell Mtn. ELEVATION: 1664 Ft. / 1650 Ft. TRAIL: Whiteface Mountain Trail, Bushwhack, Abandoned Rd. PARKING: From route 11A in Gilford turn on to Belknap Mountain Road. Follow it to the 3 houses at the end of the road. There is limited parking available and the Whiteface Mountain Trail begins on the left side of the road just before the first house on the left. DESCRIPTION: According to the Belknap Hiking guide map the Whiteface Mountain Trail has a moderate incline. I found the incline very gradual and an enjoyable walk as the trail transitions from hardwood forest to a wide trail through a plethora of blueberry bushes. The Whiteface Mountain trail was well defined the full 1.5 miles to the Whiteface Mtn. summit. The summit isn't clearly marked but there is a popular highpoint. I continued my hike to the trail-less Durrell Mtn. 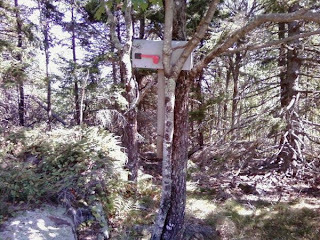 by bushwhacking due south approximately 0.15 miles through shin scratching blueberry bushes then continuing 0.35 miles through the open woods of the Whiteface Mountain southern face to a 4x4 road that crosses the saddle between Whiteface and Durrell. I crossed the 4x4 road and bushwhacked directly up the northern flank of Durrell Mtn. The bushwhacking was challenging through thick spruce trees and steep at times. After 0.45 miles I reached the 1650 Ft. Durrell Mtn. summit. The summit is the most unique register I've seen in my hiking history. A mailbox mounted to a tree. I intended to walk the dirt and non-drivable Belknap Mountain Road back to the car (avoiding the Whiteface Summit) and bushwhacked in a Northeasterly direction 0.5 miles back to the 4x4 road I crossed on my ascent. I followed the road a short distance then bushwhacked northeast to shortcut a 90 degree right angle intersection between the 4x4 road I was on and Belknap Mtn. Rd. It was slightly shorter but didn't save me much time. The final 1.75 miles was a dirt road walk back to the car. I took twice as long as suggested because I stopped every 10 steps for a new handful of huge, fresh, ripe, delicious blueberries. I absorbed the great views from the mainly open Whiteface Summit then descended via the unmarked, unlabeled and unmapped "HockeyPuck trail" (aka - bushwhack) down the south side of the mountain. I bushwhacked down the southern ridge to the 4wd trail and headed straight up Durrell Mtn. and the mailbox summit register. There is a geocache (poorly) hidden in the mailbox. My chosen route probably wasn't the smartest because I chose the shortest & steepest bushwhack but I was secretly hoping I'd encounter some sort of trail, I never did! The whack wasn't as difficult as it could have been but on a hot sticky afternoon tuckered me out. A mailbox summit register on Durrell Mtn. I was over 2 miles from my car still searching for a trail. I descended via a northeasterly bushwhack in a straight line towards the car and angled my way towards the 4wd road. I eventually found the road with about 1.75 miles to the car and instead of following the road to a 90 degree turn continued across the "street" and bushwhacked along one of the elevation contours of Whiteface before hitting the correct road with a 1 mile dirt road walk.